1st leg: Cast on 54 sts and knit 3 rows ga. Continue knitting pattern 4 cm. (See pattern for the dress) Continue knitting st st inside 2 sts at each side knitted in ga = edge sts. At the same time continue knitting pattern over the 6 sts center sts 10 rows altog. Put work aside and knit the other leg in the same way before knitting both legs onto a circular ndl or 4 double pointed ndls and continue knitting in the round. Knit 2 rows st st over all sts and continue knitting the 6 sts pattern along each side. 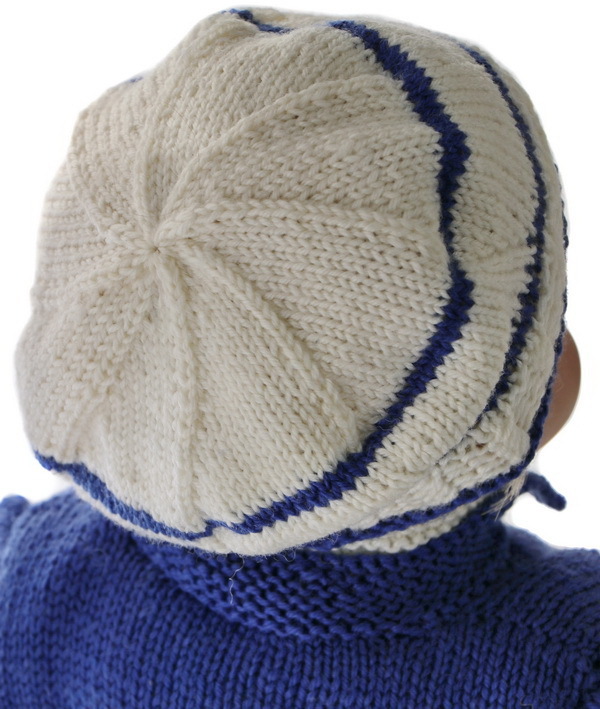 (When knitting pattern in the round every second row of the pattern has be knitted like this: p2,k2,p2. Place a marker for center front and center back. Begin row from center front: k1, k2tog, knit st st and pattern until 3 sts before center back, k2tog TBL, k2, k2tog, knit st st and pattern until 3 sts before center front, k2tog TBL, k1. Repeat these decreases every 3rd row 3 times altog. Continue knitting st st and pattern until work measures 11.5 cm before knitting the suit back longer like this. Knit to center back. K15, turn, purl 30, turn, k25, turn, purl 20, k15, turn, purl 10. Continue knitting st st over all sts until work measures 12 cm (measured front). Then knitting back and forth to get an opening along the center front. Cast on 4 new sts at the beginning of the row and continue knitting st st and pattern at each side across row. On next row from WS k3 (edge sts knitted in ga along the opening), purl back, continue knitting pattern until 10 sts are left on row, k10 pattern. Repeat these 2 rows once more. Continue knitting front band and pattern over the 10 first sts on row like pattern and front band for Tea’s dress. 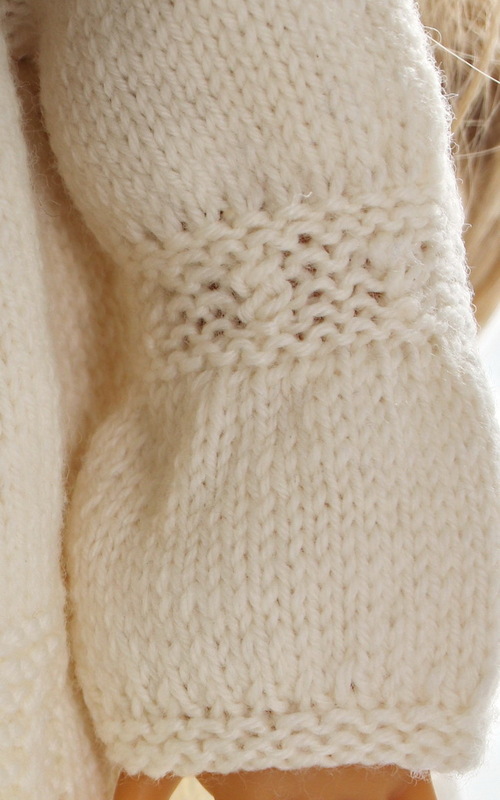 On the 11th row pattern knit the 1st buttonhole like this: k2. K2tog, yon. Repeat buttonholes having 16 rows between the holes. Continue knitting like this until work measures 21 cm. On next row cast off the 6 sts pattern at each side, and continue knitting the front and back of the dress separately. I think these clothes will be superb for celebration and cold days. 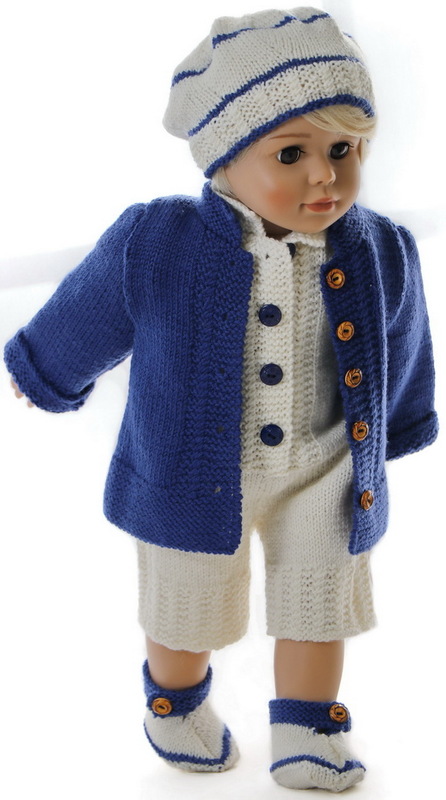 I am also sure your doll will look fabulous in the clothes. First of all I knitted this lovely white dress for Tea. 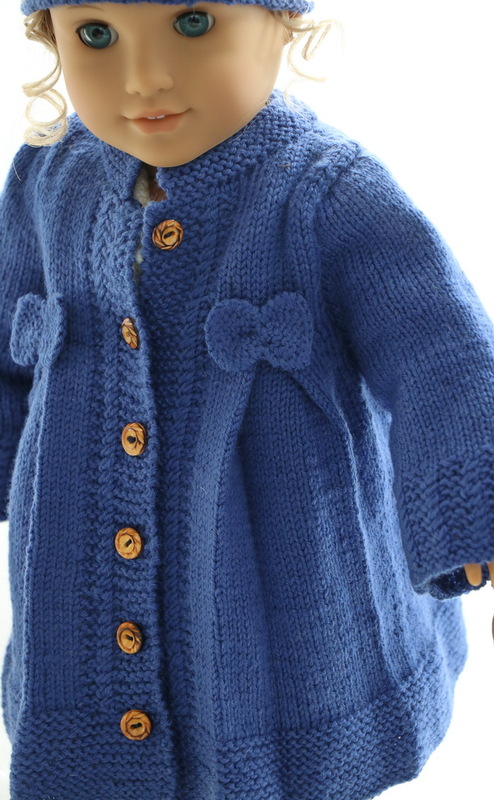 The dress is buttoned front with small blue buttons. 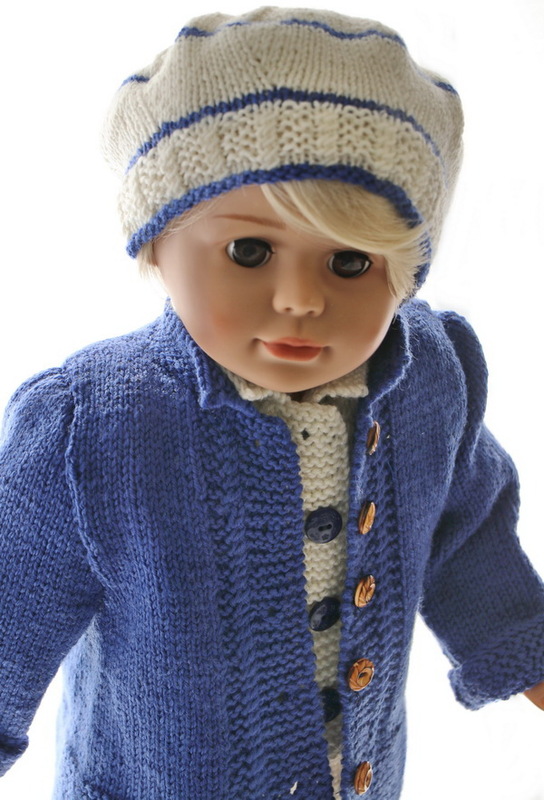 The pattern for this outfit has thin, small cables over only 2 sts between garter sts. 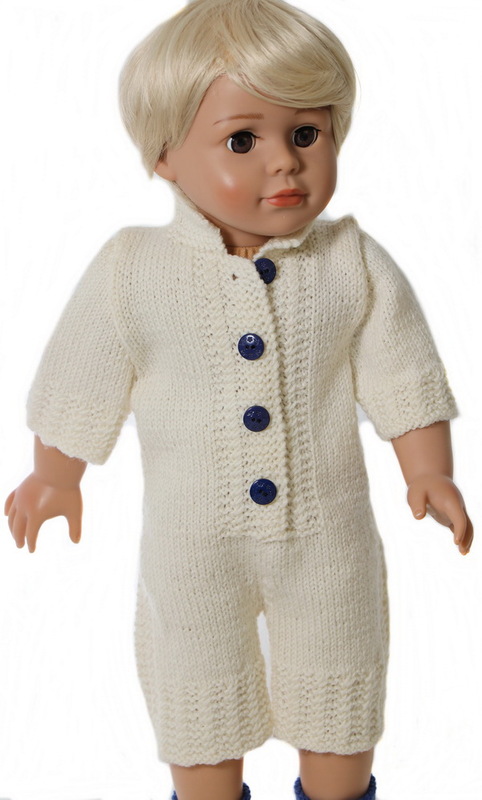 Then I knitted a white suit for Teo. 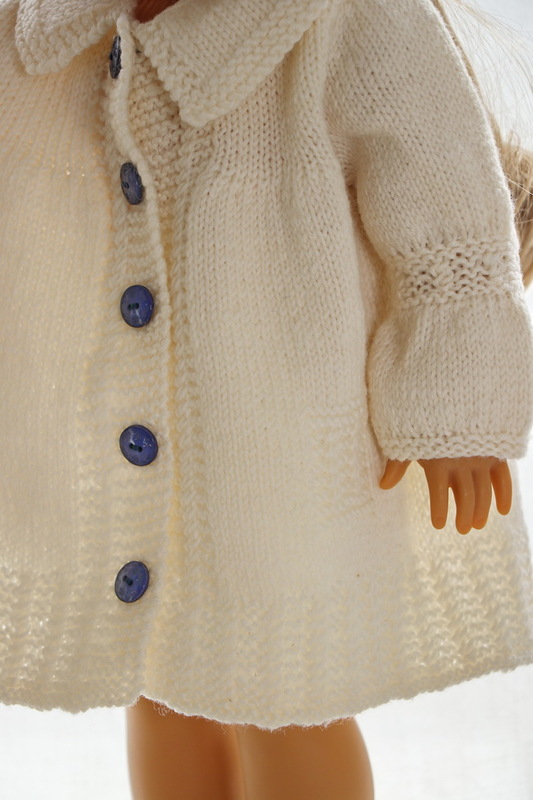 The suit has wide legs knitted in the same little cable pattern and buttoned with the same buttons as for Tea’s dress. It is short-sleeved.
. 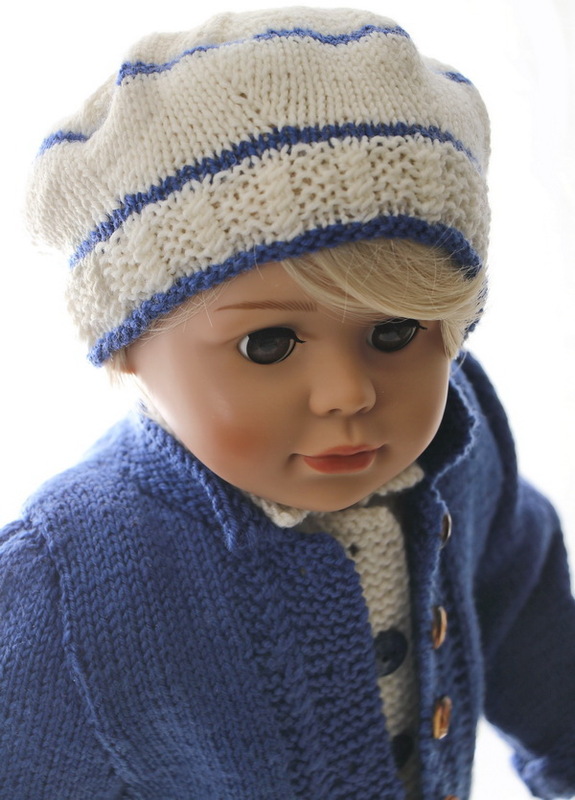 It is knitted in white and I believe your doll will look beautiful in this color. 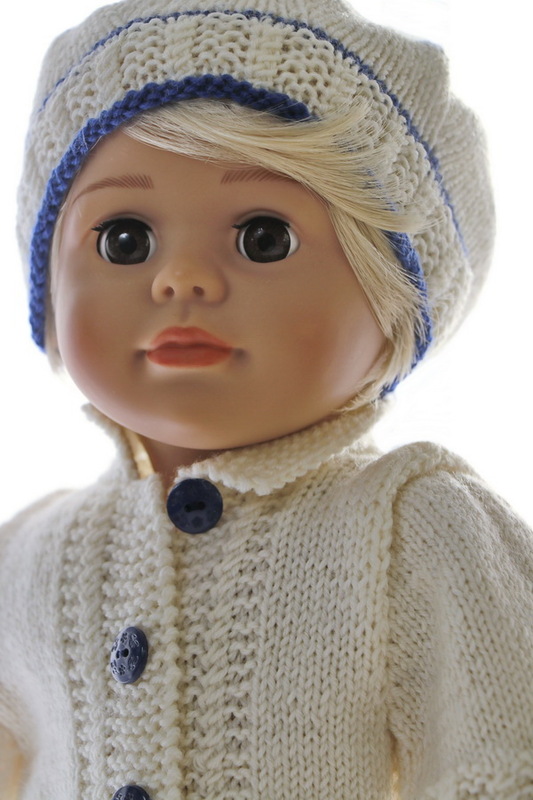 Beautiful dolls dress for celebration and party. To be outdoor they both needed warm coats. 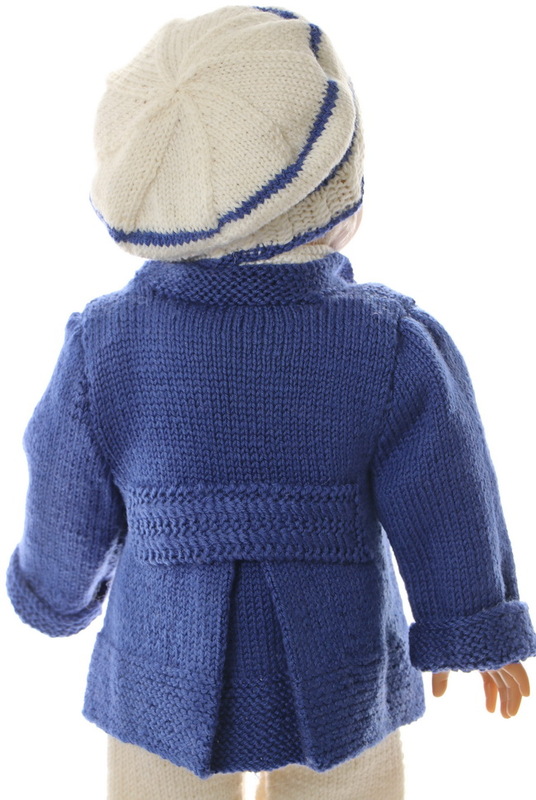 The coats are knitted in dark blue and have the same pattern as knitted for the dress and suit. ... and back and are superb to wear over the dress and suit. The caps are the same for both dolls. ... and complement the clothes very well. 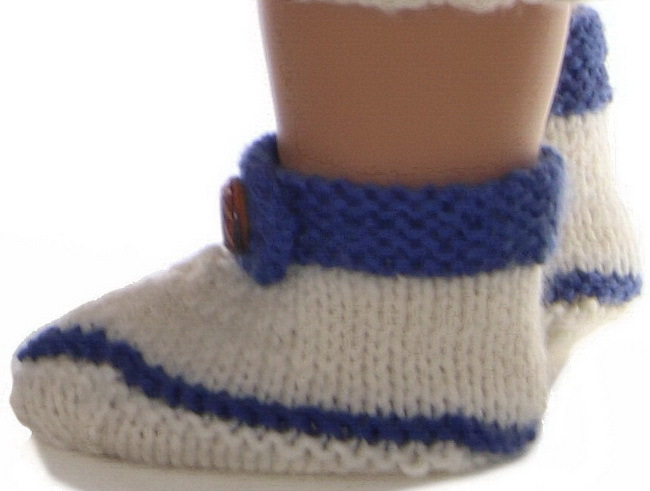 At last I knitted a pair of shoes in white. The shoes have blue edges as well and they are buttoned round the ankles. 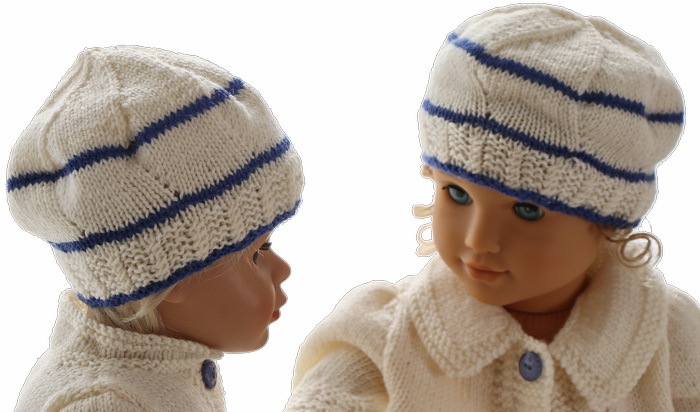 I think your dolls will be well-dressed and look very smart in these outfits knitted in blue and white! 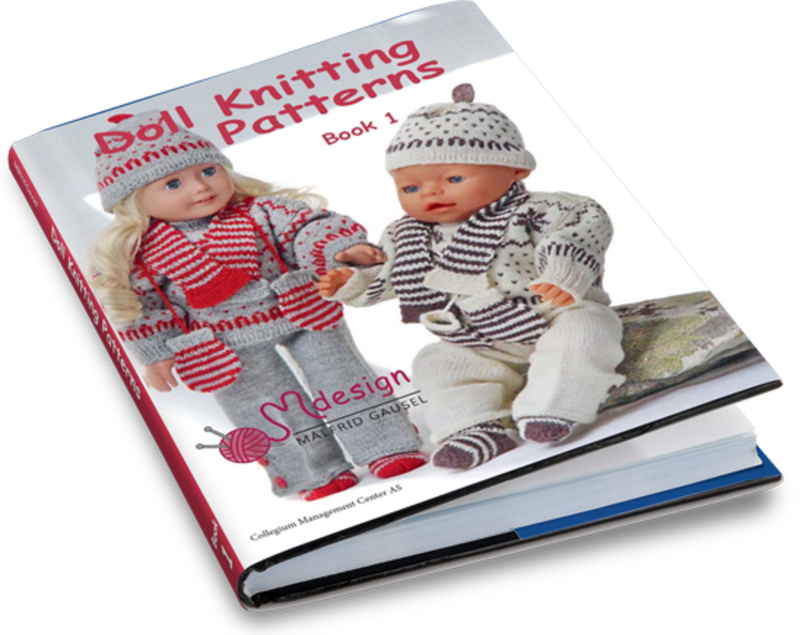 What do you think about the doll knitting pattern above (and below). Leave your comment to me in the box below.